Norwood is a neighbourhood in the east side of Winnipeg bounded by the Red and Seine Rivers, Marion Street and Carriere Avenue. The area is not far from the forks of the Red and Assiniboine Rivers, a site that was used for many generations for camping, trading and other activities by Indigenous peoples. In the early nineteenth century the area to the east of the Red River was settled by groups of fur traders and mercenaries hired to protect the Red River Colony. Soon after, the Catholic church – led locally by Québécois Father Joseph-Norbert Provencher – was given title to a large tract of land to the east and south of the forks, a territory which came to be known as St. Boniface. It was incorporated as a town in 1883. During this early period Norwood remained largely empty of settlement. The district featured a prominent dip where an earlier oxbow lake had been formed by the changeable Red River; today the curve of Enfield Crescent (formerly Oak Avenue) preserves this aspect of regional topography. Things started to change in 1891 when it was announced, in January of that year, that a new suburb would be constructed. To be known as Norwood, the development was led by three interrelated firms: the Norwood Improvement Company, the Norwood Bridge Company and the Norwood Electric Tramway Company. These three organizations (owned by a group which included a number of senior Canadian Pacific Railway officials) purchased 400 acres from the Town of St. Boniface and set about work on what was marketed as “A Pretty Suburb” to feature “Villa Residences Across the River.” The territory was divided into two large sections, the Oak Park district east of St. Mary’s Road and Norwood, to the west, both with a grid-based plan. While it is uncertain why the name Norwood was chosen, it may have been based on a London district of the same name. While St. Boniface as a whole was a French-speaking area, Norwood was marketed to English speakers. Street names were to be drawn from Canada’s British Governor-Generals (today’s Monck Avenue remains from this original program) and, over time, Anglican, Methodist and Presbyterian churches were constructed to serve local citizens. By October 1891 Norwood’s developers had completed a pontoon bridge, connecting the area to the more populous west side of the Red River, which was replaced with an iron bridge built in 1893. (The town council of St. Boniface gave $35,000 toward this end and purchased the bridge in 1909.) In 1894 the area became home to the first golf course in Winnipeg, the Winnipeg Golf Club, with nine holes, though this endeavour would soon move to a site on Portage Avenue. Near the same time, a 16-court tennis facility and cricket grounds were completed at the intersection of St. Mary's Road and Taché, later to become Coronation Park. A treed drive hugging the Red River was also constructed. In 1903 street car service was inaugurated in the area, with the Winnipeg Electric Street Railway Company given a 40-year franchise to operate. Tracks were laid along Marion Street to Des Meurons and along Taché from Marion north to Provencher Boulevard. By and large, development first occurred in the Oak Park area, with much of Norwood taken up by a new golf club established in 1906 at the far south-west corner of the district. During the 1940s the course and the rest of Norwood began to be developed at greater speed. Gaining attention for this growth was a 1944 raffle of a home at 419 Lyndale Drive, designed by local architect Edward Fitz Munn, by Kiwanis Club – a home located at the site of the former third hole of the golf course. Not long after, new subdivision plans filled in the remaining vacant areas. London Life Insurance Company was the prime developer, responsible for building 205 homes which sold for between $7,000 and $10,000. The area was marketed as “the latest modern type of subdivision development.” Based on input from Eric Thrift of the Greater Winnipeg Town Planning Council these plans featured a “stream-lined” community design influenced by a new street-organization plan first made famous in Radburn, New Jersey, that saw homes face parkways or community walks and vehicular traffic set at the back. Similar plans of a larger scale were completed across the river in the Fort Garry neighbourhood of Wildwood. Featuring alphabetically arrayed streets with names drawn from trees, the new Norwood district was given the name “Lyndale Park.” A recently completed dyke was responsible for largely protecting the area in the 1950 flood. In the years since the neighbourhood has remained largely residential and heavily treed, with commercial areas located along St. Mary’s Road, Taché and Marion Street. In 1968 Église du Précieux Sang (Precious Blood Roman Catholic Church) was built at 200 Kenny Street according to designs by architect Étienne Gaboury, becoming a local landmark. 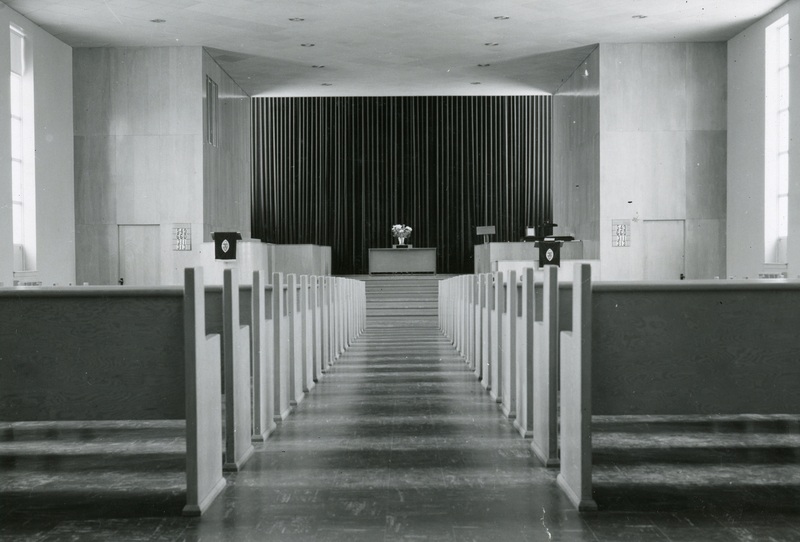 In 1951, Lawrence Green (of Green Blankstein Russell) designed an addition to exterior of the church. The addition is located at the left of the tower. Neil Bingham, A Study of the Church Buildings in Manitoba of the Congregational, Methodist, Presbyterian and United Churches of Canada. (Manitoba Culture, Heritage and Recreation, Historic Resources), 1987. Winnipeg: Norwood File, UCA. 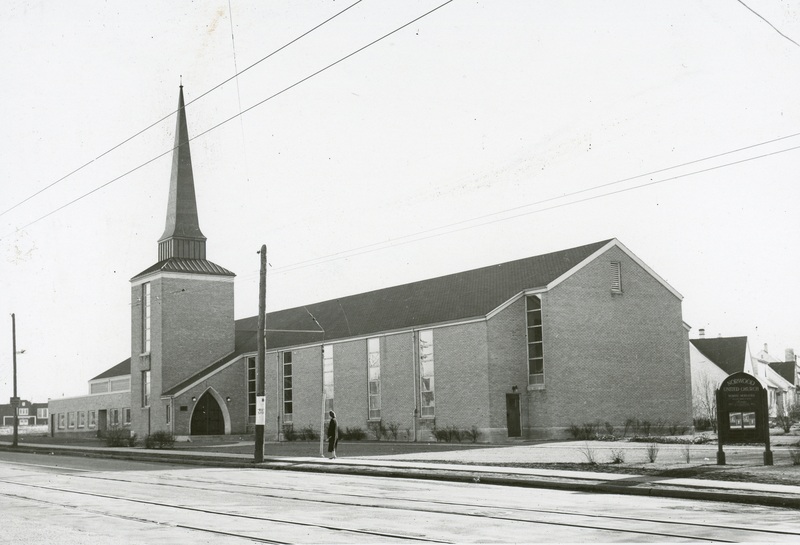 "Norwood United Church: Golden Jubilee, 1904-1954" 4. United Church of Canada, Conference of Manitoba and Northwestern Ontario Archives. University of Winnipeg.